F&W follows Pernille Zierau Larsen on Instagram and Tumblr for her black-and-white (or barely-colored) Copenhagen imagery. And for the pug shots. Larsen snaps her dog Woody in various situations, like riding in a bicycle basket staring at the road ahead, and slips those moments into a feed of graphic lifestyle pics. The result feels highly-curated and naturally Scandinavian. “To me, less is more,” she says. For aspiring photographers, she recommends focusing on one interesting element in the frame. “Things don’t necessarily have to be in the center—try shooting the same subject from different angles,” she adds. Click through Pernille’s F&W Photo Tour: Copenhagen. 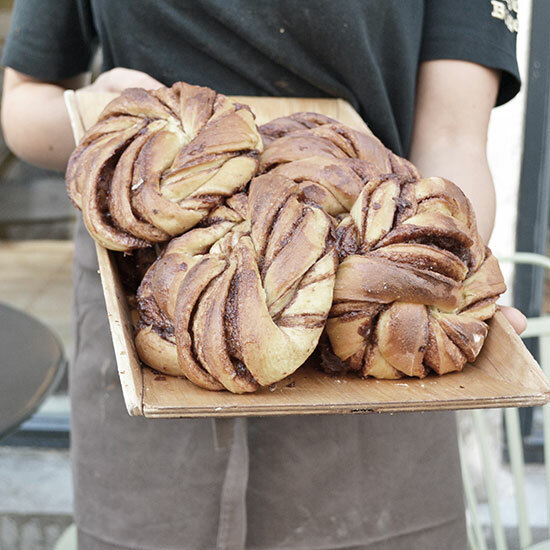 And, below, find her insider picks for the best cinnamon buns and Scandi shops in her city. Favorite Copenhagen restaurants. Two things come to mind. The indie restaurant Manfreds & Vin for beef tartare with watercress and toasted rye bread. And the beautiful restaurant Mother, which serves the most delicious stone-oven-fired pizza: "Burning Love" with mozzarella, potatoes, fried onions and smoked pancetta. Best Copenhagen bakeries. Meyers bakery has the best cinnamon buns. Brød bakery makes the most wonderful buns and chocolate croissants. Essential Copenhagen coffee shops. Original Coffee is low-key, with a great interior and I always stop by for a flat white when I’m in the neighborhood. Riccos is right around the corner from my house, and the place I go for a latte to-go. Go-to Copenhagen bars. Mexibar is a fun and quirky bar for old-school, colorful drinks. Malbeck Winebar is a beautiful, rustic wine bar with a nice selection of wines, especially reds, which are powerful and intense. Paté Paté is also great for wine—I like the Riesling Kung Fu Girl from Columbia Valley. Dyrehaven is a hip, young bar—ideal for a beer. Beautiful Copenhagen shop. COS is a Scandinavian clothing line with simple, sleek and clean-cut lines. It’s classic, feels very high-end and the quality is great. I almost never leave the COS store empty handed. Ultimate Copenhagen souvenir. I would invest in some Danish design, whether it be a graphic print to hang on your wall, a design object for decoration or some ceramics for the kitchen. Illums Bolighus and Stilleben are both great places to get items like this.